2015 will mark 107 years since the Cubs won their second and last World Series. Since then there have been repeated. Indeed, they were the first to win two classic autumn followed, 1907 and 1908, both against the Detroit Tigers. Coincidentally, the last time they were in the big party in 1945 was also against Detroit, losing in seven games. Despite the absence of 69 years in these classic of classics, North Chicago fans have been very loyal to her cubs for years have filled Wrigley Field and even the neighborhood and see the games live through buildings around the historic park. The baseball tradition in that part of Chicago has been extraordinary since the franchise was founded in 1876, the year the National League was inaugurated. In fact, the Cubs are the only team to have played every year since its inception. Originally his name was the “White Socks”. Then from 1903 they changed to “Puppies”. For the Cubs, it seems unusual for a tradition so rooted, a team that has never stopped playing since its inception and with so many excellent players who have passed through their ranks have not won more World Series since 1908. It becomes hard to believe, but it’s a reality. 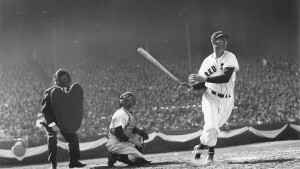 The last World Series that was involved 1945. Certainly that year World War II ended, so therefore were restricted travel. The first three games in Detroit and Chicago played four. The Cubs won two of three in the city of cars. Series to transfer him to the Windy City in the first game a certain Billy Sianis, owner of a small little bar in near the stadium, had two tickets to the autumn classic and one of them used it to “Murphy” a Goat rescued from death after falling from a truck passing by your local. Both tickets were for seats behind the plate, the best of Wrigley Field. They come to that memorable fourth game, and the fans first laugh to see Sianis go with the goat, which was very well dressed in a sweater he had in embroidered English letters “We got Detroit’s goat” (We have to Detroit the neck). The truth of the matter was that fans complained about the presence of “Murphy” arguing that the smell was disgusting pet. The protest came to safety, they came and forced Sianis vacate and leave the stadium with his beast (Meeeee!). Better, leaving Sianis with “Murphy”, he gave them forty thousand curses the Cubs, “That would never ever not to win a World Series!”. The truth of it is that this curse has lasted for years. Well, this year the Cubs think breaking once and for all, and are on track. Despite not having won more than 100 years the Cubs have one of the biggest fan bases in America. Many wonder what happens to this team never fails to win, has had in their ranks great players, Hank Wilson, Ernie Banks, Billy Williams, Ron Santo, Ferguson Jenkins, Andre Dawson, Rick Sutcliffe, Greg Maddux, Ryan Sandberg, Sammy Sosa Mark Grace, and others who have contracted to solidify the team, but still have failed to break the curse of the “Goat”. In 2003 they were close to reaching, I had 3 wins and 2 lost to the Florida Marlins (now Miami), one more victory and went to the World Series. The sixth game the Cubs won 3-0 in the eighth inning when, after getting the first out, there was something unpredictable. A foul on Luis Castillo’s left wing appeared that captured the outfielder Moises Alou, he jumps but a fan (Steve Bartman) interferes and takes the ball. Fatal, Castillo continued hitting, receives ticket and after that one inning of 8 races broke out, so the Cubs lost the game 8 to 3. The next again lost and so were gone his way to the World Series, and think who they were within five outs of doing. The Cubs, after winning in 1907 and 1908, have fallen seven times in the World Series: at Philadelphia Athletics (1910), Red Sox (1918), again against the A’s in 1929, against the Yankees in New York in 1932 and 1938, and to the Detroit Tigers in 1935 and 1945. Will the curse of the goat break? Well, this year might be, have an excellent strategist in the person of Joe Maddon, lover of surprising moves, the “squeeze play” wedge that play brings the winning run to rubber, in addition to having players many young people as Kris Bryan, Addison Russell, Starlin Castro, Anthony Rizzo, Kyle Schwarber, Jorge Soler, Dexter Fowler, Hector Rendon, Jake Arrieta, insurance latter Cy Young winner in the National League, and as others have made these puppies 2015 a team with excellent opportunities to win the big trophy of the World Series.